Trudy Wohlleben just send a group of scientists in Denmark, England, Canada, and the US the latest RADARSAT image of the ice island that formed in Petermann Glacier earlier this week. 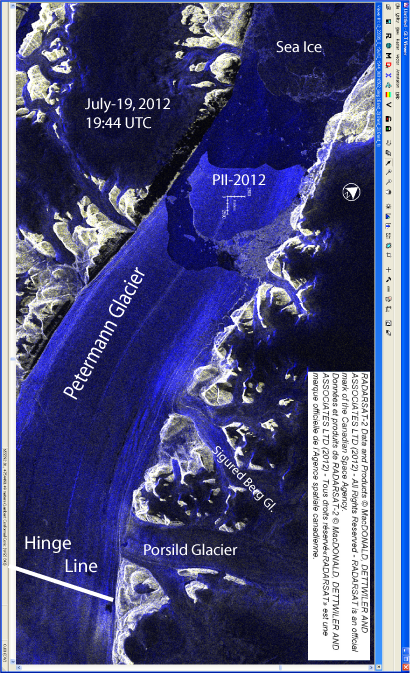 RadarSat Image of Petermann Ice Island (PII-2012) and Glacier kindly provided by Trudy Wohlleben, Canadian Ice Service. The location of the hinge line is approximate only. Note, that this is a sketch, we are not entirely sure how deep the sill is and we are not entirely sure how the ice thickness changes across the fjord. Lets ignore these details even though the may become important if one needs to consider balances of mass and forces. 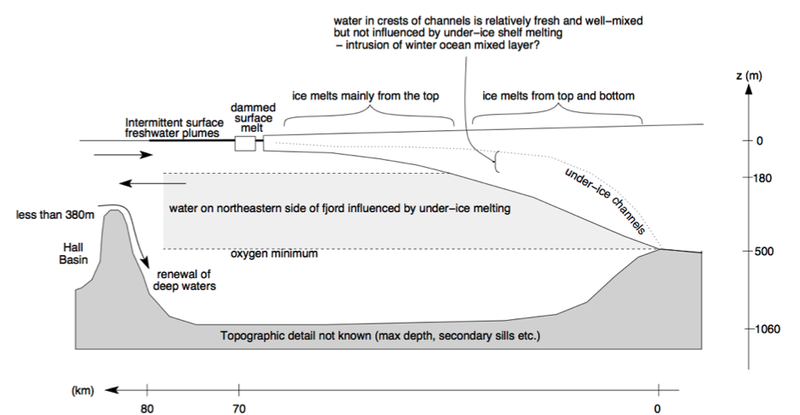 We used this sketch to conceptualize what and where the ocean may melt the glacier from below. All of this was published last year as Johnson et al. (2011), but we actually submitted it before the 2010 calving event. Peer-review takes time and the current rapid changes all around Greenland often over-take this slow process by creating new situations on the ground such as the 2010 and 2012 calving events, but this is not the point I try to make. It perhaps surprises, that the warmest waters in Petermann Fjord are found 200-300 meters below the surface. Warm water rises to the surface, right? Wrong, it only does so, when it is lighter, but the warm water at depth is actually very heavy on account of the salt it contains. The distribution of temperature and salinity is typical for the entire Arctic Ocean and there are no real surprises here. Also note that the surface waters down to 100 meters or so are very cold and contain less salt. This is the Arctic or Polar water near the freezing point that is cooled by the air and the sea ice it may melt. The warmer waters at depth originate from the Atlantic they are little affected by local air temperature or ice. I do not want to talk about too much, but if you really want, have a look at Muenchow et al. (2011) where I discuss the change observed in these deeper waters. Now lets put together the ocean temperature data from the 2009 Petermann sections with the sketch of the floating part of Petermann Glacier. The heat from the Atlantic Ocean is exactly at the place where the most ocean melting takes place. 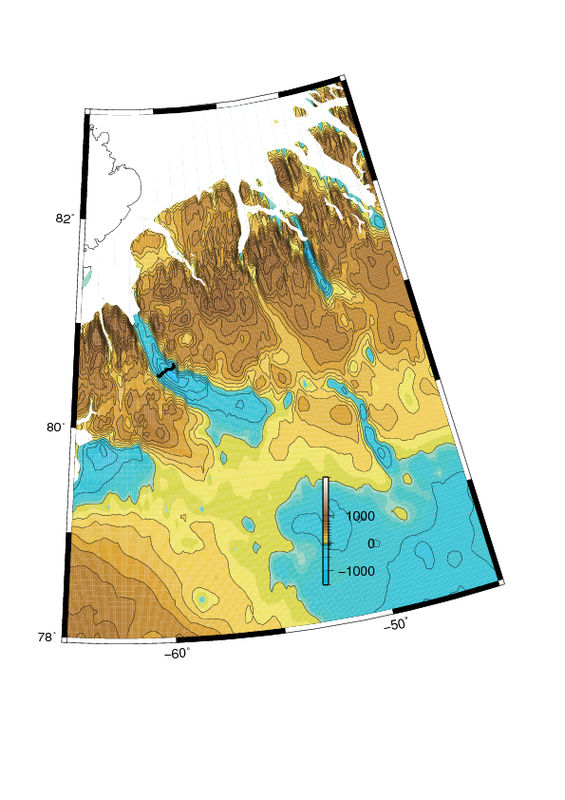 If more Atlantic water enters the fjord more often (recall, some of it may have to “climb” over the sill of unknown depth to enter from adjacent Nares Strait), then it is likely, that more melting takes place. Furthermore, with the removal of this much ice-shelf that was previously attached to the vertical side walls of the fjord a stable and steady force balance of the glacier may have been disturbed. Thus, the glacier may go through a transition at the same time that air temperatures, ocean temperatures, ocean salinities, and Arctic ice cover all also go through their own transition. This entry was posted in Ice Island, Oceanography, Petermann Glacier and tagged Arctic Ocean, atlantic, climate change, freshwater, glaciers, Greenland, Nares Strait, Petermann, predictability, sea level rise. Bookmark the permalink. 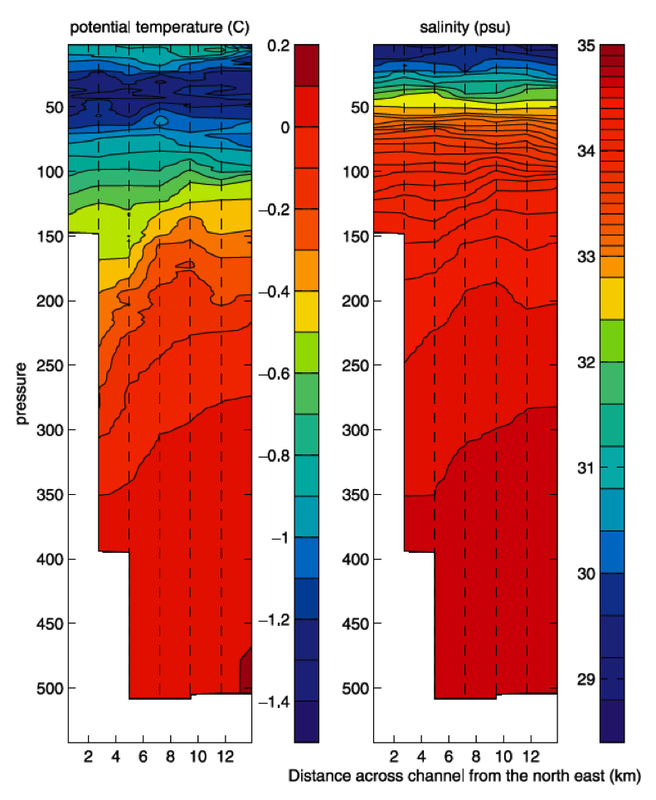 The topographic profile for the hinge line is much different than for Pine Island Glacier. For Petermann the hinge line is indicated to currently be within the area of maximum depth, that extends no more than 10 km inland from the present hinge line. Thus, beyond the 10 km hing line migration the bed depth is rising. The fjord also widens at this both, which is likely one of the reasons for less overdeepening. For this reason thinning of the glacier that can lead to migration of the hinge line-grounding line is not a good mechanism beyond the initial deep trough as seen in the Bamber bedrock image. Contrast this with the Pine Island Glacier where the grounding line currently is near the start of a very long deep trough that extends a further 150-200 km inland before the basal depth is reduced. There is not a location along this trench for a stable grounding line position. This is the setup that has led to the PIG being the weak underbelly of WAIS. Mauri: There sure are lots of differences between the grounding lines of Pine Island and Petermann Glacier, but the Bamber et al. (2003) bed rock geometry of northern Greenland indicates that the present hinge line of Petermann is at a local minimum depth NOT a local maximum. Admittedly the data are sparse with resolution no better than 5 km, but the local maximum in depth of the bedrock is many kilometers landward as this graphic shows in this post that I made 3 days ago. I also wrote about the Pine Island grounding line earlier this year. What sets us apart, Mauri, I try to find common physics, processes to learn and connect basic principles while you argue that each glacier is special and unique. I think both perspectives are valid and not as mutually exclusive. There is strength in diversity. 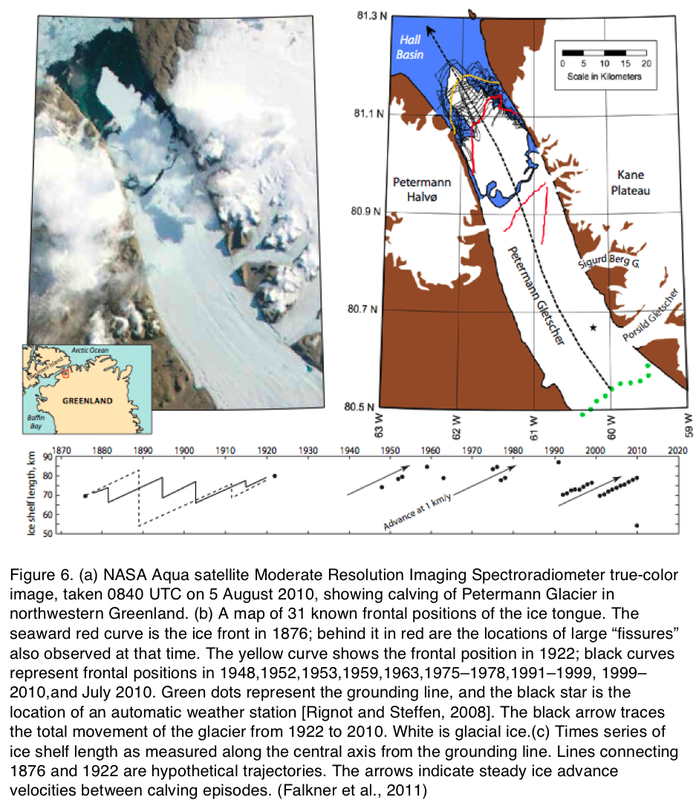 I understand that the University of Kansas group did radar surveys from the air since 2009 to improve the spatial resolution and perhaps resolve how Petermann Glacier may or may not connect to the larger depression under the Greenland ice sheet. I have a copy of a presentation as well as some data that they published on the web, but I have people coming for a barbeque, so, this will have to wait a day. Do we know if the grounding line is actually on bedrock, or is it possible that the bottom of the fjord is, at least in places, loose rocks or even gravel? I don’t think anyone has ever seen the bottom except via echos from radar or acoustic waves bouncing off it. I am no geologist, but I always thought that the rocks of Greenland are some of the oldest on the planet. I would also expect that a moving ice sheet or glacier 600-800 m thick moving slightly up and down and back and forth with the tides, would crush all and any softer materials. That was my long answer. Short answer: I do not know. I have tried to ask this of Dr. Trudy Wohlleben, but cannot find a link for contact, so I ask the question here. I am intrigued. The Peterman Glacier has new, very large area “Chunks” calving off the leading edge; an edge that only moves at a very slow rate. However, the latest image, (link below), shows us that the huge Ice Island “Chunk” has drifted a considerable distance from the Glacier leading edge. Is anyone monitoring the velocity of movement of the water upon which the Peterman Glacier is floating? It seems to me that for the new chunk to move so far in such a short period; the underlying water is flowing at a relatively very high rate that may reflect an increased level of ice melt at the base of the Greenland ice sheet. That the increase in calving is the direct result of an increase, not in the replacement of the surface waters from outside of the Fiord but instead from a massive increase of the flow of melt water flowing out from Greenland; UNDERNEATH the glacier. Are there any reference papers I can review? Again, would the same question apply for the Pine Island Glacier in Antarctica? That there is a considerable and recent increase in the underlying flow of melt water beneath the glaciers? A new chunk of Peterman Glacier broke off in July 2012, two years after another large ice island was launched. In the same week, the surface of the Greenland ice sheet experienced unusually widespread melting and some flooding along rivers. Once separated from the floating glacier, the ice-islands are indeed moving mostly with ocean currents and to a lesser extend winds. The motion of these ice islands or large tabular ice bergs from Petermann consistently follow the swift currents that we observed in Nares Strait for the 2003-12 period. I continue to monitor and post daily visible and thermal MODIS imagery for Nares Strait and adjacent areas at http://muenchow.cms.udel.edu/MODIS/ free for all to use. Nobody is currently monitoring ocean currents of properties anywhere in or near Petermann Fjord or Nares Strait. Nobody has ever deployed any instruments inside Petermann Fjord. We had instruments in adjacent Nares Strait, but recovered all of them a month ago as the funding of a large science project expired more than 3 years ago. There are plans in the work and proposals being written to remedy this situation with regard to Petermann Fjord and Glacier where even the bottom topography is still largely unknown except for the spotty data we collected there in 2009 and 2012. I believe that the physics of ice-ocean interaction and the melting underneath Pine Island and Petermann Glacier are indeed similar, but indications are that Pine Island left its grounding line some time during the last 20-30 years, while Petermann Glacier has not done so yet to the best of our knowledge. Also note, that the melting takes place where the glacier’s thickness changes from 600 to 200 meters within about 20 km or so of the grounding line (Rignot and Steffen, 2008). The grounding line is just upstream of Porsild Glacier, the very wide side-tributary glacier emptying into Petermann on its south-eastern side. Thank you. I have now made useful contact with Trudy Wohlleben and she has passed some interesting papers my way. It seems everyone has come to the same conclusion; that we need to retrieve much more information about the under ice shelf environment of the Petermann Glacier. My interest was sparked by the thought, (not totally laid to rest by your answer); of what are the flow rates, in both directions relative to depth within Petermann Fjord….. rather than Nares Strait. I have some ideas of how that might be retrieved, along with other information from the full length of the Fjord both under the ice tongue as well as the bottom of the Fjord itself.